A FANTASY COME TO LIFE – LITERALLY. Emma Gavin writes bestselling novels about werewolves, but that doesn’t means he believes in them – and she certainly doesn’t think she’ll meet one. But that’s exactly what happens when her books catch the attention of a rich of powerful pack of Manhattan Weres, who have kept their existence hidden for centuries. Alarmed by the accuracy of her novels, they’re determined to find out if a renegade is acting as her informant. Aidan Wallace, the pack leader’s son and heir, knows he’s the wolf for the job, but when he gets too close to Emma, they are both surprised by an attraction too strong to deny. To surrender to it, Aidan will have to risk everything – including the security of the pack he’s sworn to protect . . . I love when authors write about authors. Sometimes it's a little tough to swallow when they're first timers, but a veteran writer like Vicki Lewis Thompson can definitely get away with it. Main character Emma Gavin is a highly successful author about to go on tour for her latest werewolf romance novel. Aidan Wallace is the werewolf charged with ferreting out her source within the werewolf community. After watching her every move for the last three months, Aidan is ready to call an end to the operation when he discovers a werewolf has been contacting her . . . and may be gearing up to show her that werewolves are real. Now, Aidan is acting as Emma's security on the book tour. The hardest part won't be guarding her from other werewolves, though - it will be keeping her body safe from himself. While this was a great, quick, fun read, I had a few issues with this novel. First was Emma's hypocritical attitude. She constantly berates Aidan's money, yet she is making enough to afford an apartment in Manhattan (that's not cheap!) and name brand outfits and shoes. If anything, Aidan and his family make better use of their money by donating to a number of charities, whereas Emma probably doesn't have much left over to donate. Aidan even called her on her attitude at one point, yet Emma never really changed her attitude or apologized sincerely. That was a little frustrating. Also frustrating was Emma not seeming to grasp the reality of the situation towards the end of the book. She kept harping on how she would rather die than not be allowed to write - yet that was a definite possibility, and it didn't seem like she realized just how possible it was. I understand that writing is part of who she is, but she could have been a little more concerned about the death part. Overall, though, the pros far outweigh the cons. Emma and Aidan have a seriously hot romance, and it felt very sincere considering the compressed timeline. I would say that Thompson's first foray into the werewolf genre is highly successful. 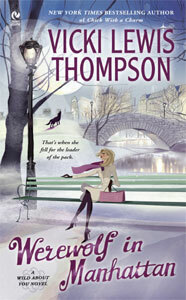 The second Wild About You book, A Werwewolf in the Northwoods, will be released in October 2011! Nice review! I have got to get this one.